Nathan and Bub Bright meet at the local landmark known as the stockman’s grave, where the body of their middle brother, Cameron, lies roasting in the sun. Evidence suggests that Cameron spent his last few hours on earth chasing the headstone’s shadow around in a circle, trying to find some respite from the hot Australian summer sun. From what they can understand, Cameron has left his car – and his supplies of food and water – and walked to his death in the dusty outback a handful of days before Christmas. And while there are reports of difficulties and disagreements, no-one can explain why a sane man would take such drastic action knowing that he wouldn’t survive a full day. But the alternative is even more unthinkable, and in a world where “next door” is a three-hour drive the suspects are few and far between. The Australian outback is a place we’ve all heard of, but one that we’ve probably never given much thought to. 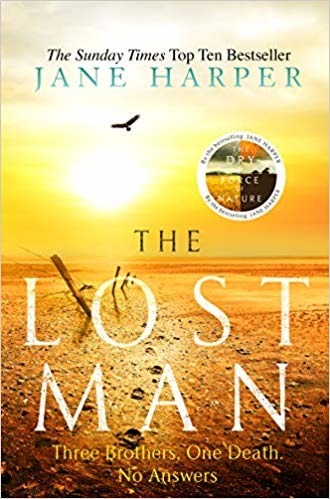 Jane Harper puts this loneliest of places at the centre of her third novel, and introduces us to the Bright family, who make their living raising beef, their farms covering vast tracts of inhospitable land in Queensland. Nathan, the oldest brother, is something of an outsider, the only family member who no longer lives in the family home of Burley Downs Station, having taken on his own farm as part of a disastrous – and short-lived – marriage that has been over for more than ten years. When his younger brother’s body is found at the stockman’s grave, Nathan and his son Xander – visiting from Brisbane for the holidays – find themselves living with their relatives much sooner, and for much longer, than they had originally planned. The population of Burley Downs Station is small and, for the most part, well-known to both Nate and Xander: the youngest Bright brother, Bub and their mother, Liz; Cameron’s wife, Ilse, and their two young daughters; Harry, a farmhand who has been working on the farm for longer than Nathan has been alive; and a pair of young British backpackers who have mustered on for a period to do some work and live the “real” life. So when it comes to suspects in a potential murder, the pot is small and, for the most part, seemingly unlikely. As Nate settles back into the family home, he discovers that Cameron may have been having some problems, the farm not running as smoothly as the older brother has often assumed. And there are rumours of impropriety, one of which dates from when the boys were teenagers, that seem to be coming back to haunt the man and his family. There is immediate tension between Nate and Cameron’s wife, Ilse, and we soon learn why this is: it’s tied to the reason that Nate hasn’t seen the nearby town of Balamara for over ten years, despite it being one of the few tenuous connections to civilisation in this part of the world. Harper’s characters are complex and layered, each with their own history that, in some small way at least, plays a part in Cameron’s mysterious end. These are people defined more by their past mistakes than by their triumphs and good deeds, grown men still living in the shadow cast by an often-cruel father, making a living in an inhospitable part of the world. It’s clear from the outset than Cameron didn’t walk to his own death, but the truth behind his last long walk is revealed only slowly as the story progresses. Like everything in this stultifying heat, the revelations of how much Cameron has changed since Nathan last saw him, come slowly, creeping up on the reader when we least expect it. The author uses the environment to her advantage, and gives the reader a sense of both the epic scale on which this story unfolds as well as the intense heat that slows everything to a snail’s pace. There is a complex thriller at the centre of The Lost Man, but it’s subject to a long reveal, a slow-motion unpeeling of layers to reveal the truth at the heart of the story. In the meantime, we feel like we have been invited into these peoples’ lives – we might be living in the accommodation block, temporary workers spending a few weeks before moving on to somewhere else – and witness as their world begins to crumble around them. Jane Harper has been garnering rave reviews since the release of her debut novel, The Dry. The Lost Man, her third novel, is the first to make it off the ever-teetering TBR pile here at Reader Dad, and I’m already regretting that it has taken so long for me to discover this incredible storyteller. Dark and atmospheric, mired in the heat and dust of the Australian outback, Harper’ is a unique voice in modern crime fiction. Her characters are flawed and human, like the rest of us, and her ability to manipulate her readers is second to none. The perfect antidote to the always-pervasive cold climes of Scandi- and Tartan-Noir, The Lost Man is a gripping and intense read that will leave you gasping for more. I, for one, will be picking up The Dry at my earliest opportunity. You might just want to keep some cold water handy!